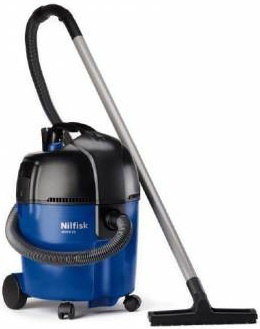 The Nilfisk-Alto Aero 25-21 is a domestic / light industrial wet & dry vacuum cleaner / hoover . The Aero 25-21 has a power take off with automatic start stop for power tools, large 25L container & a Push&Clean filter cleaning system which makes it suitable for even the toughest of cleaning task. Whether it involves water, sand, soil, ashes or wood chippings, Nilfisk Aero wet & dry vacuum cleaners / hoovers are both robust & powerful, & suitable for inside the home, garages, workshops & car interiors.